I spent the day at Batu Ferringhi Beach. 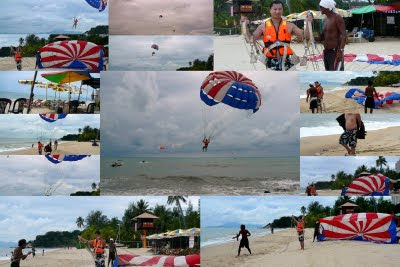 It is on the north side of Penang Island and considered one of the best beaches on the Island. While my Evergreen Hotel is also on the coast, the water and sand looks pretty polluted by city run-off. So I was please to see the clean golden sand at Batu Ferringhi. The water still looked muddy, but seem clean enough for me. It was a Sunday afternoon and hardly anyone was on the beach. I started the day parasailing for the first time. Then had some lunch. The water was to choppy for a few hours so I just relaxed and worked on my tan. I got a foot massage then did some jet skiing and tried para sailing one more time before. Getting some dinner... It was fresh! 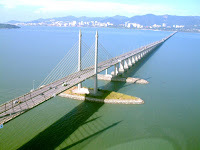 I am taking a business Trip to Penang, Malaysia. Flying from Austin to Houston, then Houston to Moscow, Moscow to Singapore and Singapore to Penang. That is over 24 hours in the Air. 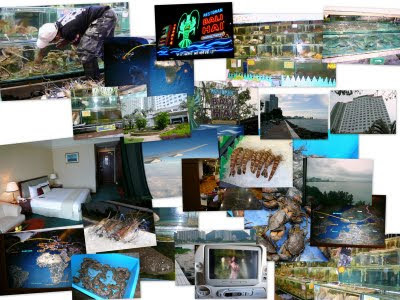 I will be staying at the Evergreen hotel, which sits on the beach on Penang Island. I may meet up with my friend Jeff. He went expatriate to Thailand a few years back. The current plan is to fly to Bangkok during my 2nd week there. I could be there for up to 3 weeks depending on how well our job goes..
Friday night turned into a good night for me after a slow start. I started out slowly losing, but ended strong. I started with $200 and slowly bleed it down to around $100. It was mainly due to me chasing to many draws from the blinds. I started to build it back to even after a couple of hours of winning small pots. The table was pretty tight (after Nicole busted out..) and I felt that I had to give someone a bad beat to pay me off. Cracking pocket Kings with pocket Queens: The first big pot was when I had pocket Queens. 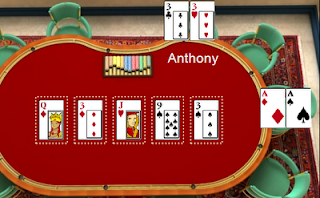 A guy that I never played with, was straddling all night long and hitting big hands on his straddle. Two of the times he hit pocket Kings and no one believed him and once another guy had pocket Queens against him. Well, would you believe that when I had pocket Queens, he also had pocket Kings, again for the 3rd time that night!!!! Damm. Well, all the money went in pre-flop and the pot was over $430. This time his kings didnt hold up. I hit my set on the turn and the board paired on the river.. Now I was back in the game with over $400 in front of me. Later, in the night I hit a set of sixes, no action after the flop... and then a set of Kings, no action again after the flop. I did make over $120 on the hand, since I pre-flop raised to $55 and actually had 2 people call me. I have no idea what they had, but they folded on the flop. I had one big blind special with J9. I hit trip Jacks and then quads on the turn. I slowed played to Sean, but he didn't bet the river..
night. I have pocket 33s and limp in. A young kid who has been playing very solid raises to $15 behind me. Their are two other callers, so I call. The flop is Q3J. I just hit bottom set. The two callers check and I bet $45. The kid starts counting a re-raise, but then decides to smooth call me. The other two guys fold. I sense the kid has either an over pair or is slow playing top set. The turn is a blank and I bet $75, figuring if he does have a set then he would let me know now. He smooth calls again! Now I figure the kid must have pocket kings or Aces and knows I am tight. He isn't sure what I have, but cant fold his hand. The river is the case three! Giving me QUAD 3333s.. Now I have the nuts! It docent matter what he has. I think for a moment what he will call, but then think if he does have a set or Aces, then he should call an over bet. I push in two stacks for a total of $200. He instant calls! and shows me pocket Aces. I say "two pair.." and the table goes crazy!!! The kid gave me allot of respect! He said he didn't re-raise on the flop, because he knew I played tight. It also helped that Bill was calling me the "Silent Assassin" and this probably put the fear of God in em. Anyways, this is really my edge! People will slow play a big hand to me, not sure what I have and if they happen to have the nuts they will push hard to get me to fold my set. Which makes for an easy lay down, since you have to be crazy to bluff me. This weekend we decided to check out Town Lake in Austin. We rented a Kayak at Rowing Dock. It turns out to be one of the cheapest place to rent a boat in Downtown Austin. You can even get a coupon here. Another place is Texas Rowing Center, I think I will try there next time. Afterwards we went to Barton Springs Pool. It is a natural pool created by a spring. The water is alwasy a cool 68F. Very refreshing, but you get used to it pretty quicky under the Hot Austin Sun. Google may be good at many things, but people search is not one of them. For that you’ll have to use a more specialized search engine. It produces not only links to all of your profiles on social networks like Facebook, MySpace, and LinkedIn, blog mentions, and photos on Flickr. It finds mentions of your name in public records, including property records, SEC filings, and birth databases. It also finds e-mail addresses and summarizes “quick facts” about the person.